Defining your mission as a writer is a powerful exercise. It’s not enough to have an idea of what you want to accomplish with your book or other writing. You need to be clear with yourself, and the sooner you can get that clarity, the better. In the past I have thought the act of writing down a mission statement was needless work. I knew why I plugged away at my editing company. I knew what my business goals were. I knew why I was writing a book. Why should I go to the trouble of writing it down? But my attitude has changed. After reading a fellow freelance writer’s argument for why mission statements are so important, I decided to give it a try. I suppose having it come from someone I knew gave it more weight. I wrote up a mission for my editing company and placed it on the home page of my website. I was blown away by the effects. Writing down my mission forced me to give my company the attention it deserved. In return, it gave me direction I didn’t know I needed. I also began getting clients who were better suited for me. That was for a business. What about a mission statement for a book? When it came time to write the proposal for my book Perfect Bound, I thought a mission statement would make a good marketing tool. Agents would love it. It would make my proposal stand out. Well, I never found out what agents thought of it. What I learned instead was that having a mission statement gave me clarity and direction. I had a concise paragraph stating what I wanted to accomplish and why. That influenced how I wrote my introduction, how I presented myself at public events, how I approached my website, and more. 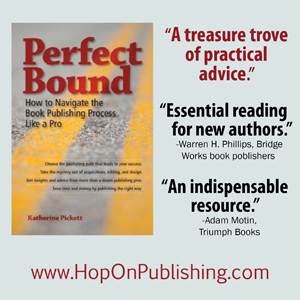 My mission in writing Perfect Bound, as it has been throughout my career, is to help aspiring authors achieve their dream of publication. Armed with the knowledge contained in this book, authors will be more confident in their approach to book publishing in general and the book production process in particular. Further, they will save time and money when they avoid the common pitfalls every author faces. Importantly, this mission statement is particular to the book I was writing and is concrete in naming what I really hoped to accomplish. It is outward-facing—that is, I can share it with my readers—yet personal, so that it has meaning for me too. The statement appears on my website, and I have often referred to it when I needed encouragement. In one of the exercises in my class Choose Your Best Book-Publishing Path, I walk students through the process of crafting a mission statement. I provide a simple formula to get you started, and we generate ideas for how you can make yours meaningful to you. Ultimately, however, what you put in your mission statement isn’t as important as the act of writing it down. Publishing is a long road. When doubt starts to settle in, a writer’s mission statement is a touchstone that reminds them why their book is worth the struggle. Katherine Pickett is the owner of POP Editorial Services, LLC, where she offers copyediting, proofreading, and developmental editing to writers and publishers across the country. She is the author of Perfect Bound: How to Navigate the Book Publishing Process Like a Pro, winner of two book of the year awards, and Freelancing as a Business: 7 Steps to Take Before Launch Day. Find her online at http://www.popediting.net.